When should you feed your animal? Consistency is key when feeding both steers and heifers. Typically, you will feed morning and night and want 12 hours between those feedings. During the summer hot weather can decrease appetite, so it is beneficial to feed early in the morning and late at night. Make sure you clean out any old feed immediately. A calf should be finishing what you have fed them in 30-40 minutes. It can take 45-60 days to see a true change from nutrition. There are products that are designed for “instant gratification” like using Vita Charge® Paste or Vita Charge Liquid Boost® to stimulate intake quickly during stress, however we recommend giving any supplement at least 30 days to start to see a long-term change. What are trace minerals and why does your animal need them? There are two classes of minerals, macro minerals and micro (trace) minerals. Macro minerals are needed in higher levels to meet your calf’s daily requirement. Trace minerals are needed in smaller amounts, but are still vitally important. Trace minerals are needed to help boost immune system and keep your calf healthy. Trace minerals also promote healthy skin, hair and hooves. When looking at the mineral source it is important that you are feeding an organic or chelated source of minerals, as these are more digestible. 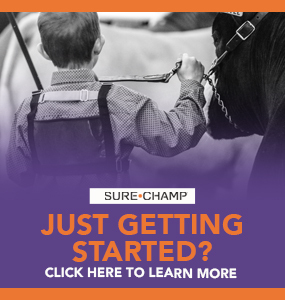 In addition to Sure Champ® offering the prebiotic Amaferm®, it also is a complete mineral package. How do you know what show feed or ration to pick? 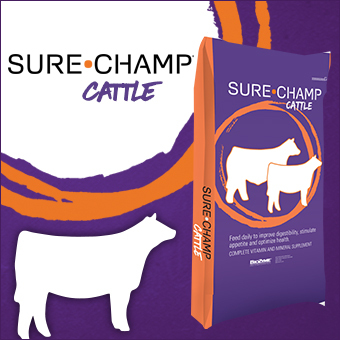 With show cattle there are lots of different branded show feeds to pick from or you might decide to have your local feed mill create a ration. Every calf is different and feeding plans should be individualized. 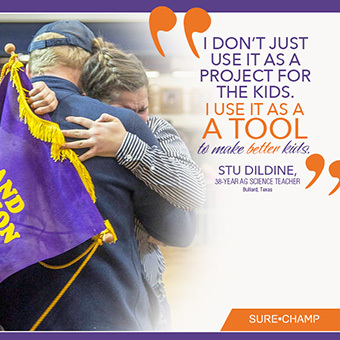 The best advice is to reach out to the person you bought your calf from, your 4-H leader, FFA advisor or extension agent, or talk to a nutritionist to get a plan that will suit your animal and your goals. Remember, no matter what show feed you choose, you still need to be feeding roughage (hay). Roughage is important to digestive health.